The oilbird (Steatornis caripensis), locally known as the guácharo, is a bird species found in the northern areas of South America (including the island of Trinidad in the Republic of Trinidad and Tobago). Nesting in colonies in caves, oilbirds are nocturnal feeders on the fruits of the oil palm and tropical laurels. They are the only nocturnal flying fruit-eating birds in the world (the kakapo is flightless). They forage at night, with specially adapted eyesight. However they navigate by echolocation in the same way as bats, and are one of the few kinds of birds known to do so. They produce a high-pitched clicking sound of around 2 kHz that is audible to humans. This is a large, slim bird at 40–49 centimetres (16–19 in), with a wing span of 95 centimetres (37 in). It has a flattened, powerfully hooked, bill surrounded by deep chestnut rictal bristles up to 5 centimetres (2.0 in) long. The adult weighs 350–475 grams (12.3–16.8 oz) but the chicks can weigh considerably more, at up to 600 grams (21 oz), when their parents feed them a good deal of fruit before they fly. The oilbird is mainly reddish-brown with white spots on the nape and wings. Lower parts are cinnamon-buff spotted with white. The stiff tail feathers are a rich brown spotted with white on either side. The feet are small and almost useless, other than for clinging to vertical surfaces. The long wings make it capable of hovering and twisting flight, which enables it to navigate through restricted areas of its caves. Oilbirds are related to the nightjars and usually placed with these in the order Caprimulgiformes. 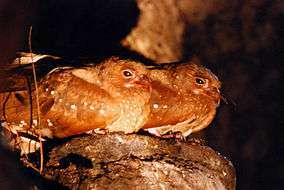 However, the nightjars and their relatives are insectivores while the oilbird is a specialist fructivore, and it is sufficiently distinctive to be placed in a family (Steatornithidae) and suborder (Steatornithes) of its own. Some research indicates that it should even be considered a distinct order (Steatornithiformes). The caripensis of the binomial name means "of Caripe", and Steatornis means "fat bird", in reference to the fatness of the chicks. The oilbird is called a guácharo or tayo in Spanish, both terms being of indigenous origin. In Trinidad it was sometimes called diablotin (French for "little devil"), presumably referring to its loud cries, which have been likened to those of tortured men. The common name "oilbird" comes from the fact that in the past chicks were captured and boiled down in order to make oil. The oilbird ranges from Guyana and the island of Trinidad to Venezuela, Colombia, Ecuador, Peru, Bolivia and Brazil in forests and woodlands with caves. It is a seasonal migrant, moving from its breeding caves in search of fruit trees. It has occurred as a rare vagrant to Costa Rica, Panama and Aruba. The Guácharo Cave (Oilbird Cave), in the mountainous Caripe district of northern Monagas, Venezuela, is where Alexander von Humboldt first studied the species. Oilbirds are nocturnal; during the day the birds rest on cave ledges and leave to find their food at night. Although they have specially adapted vision to forage by sight, they are the only birds known to navigate by echolocation in sufficiently poor light conditions, using a series of sharp audible clicks for this purpose. They also produce a variety of harsh screams while in their caves. Entering a cave with a light especially provokes these raucous calls; they also may be heard as the birds prepare to emerge from a cave at dusk. Oilbirds are colonial cave nesters. The nest is a heap of droppings, usually above water—either a stream or the sea—on which 2-4 glossy white eggs are laid which soon become stained brown. These are rounded but with a distinctly pointed smaller end and average 41.2 millimetres (1.62 in) by 33.2 millimetres (1.31 in). The squabs become very fat before fledging, weighing up to half again as much as the adult birds do. The Guácharo Cave was Venezuela's first national monument, and is the centerpiece of a national park; according to some estimates there may be 15,000 or more birds living there. Colombia also has a national park named after its "Cueva de los Guácharos", near the southern border with Ecuador. Oilbirds have been reported in various other places along the Andean mountain chain, including near Ecuador's Cueva de los Tayos and in Brazil: they are known to dwell as far south as the Carrasco National Park in Bolivia. Dunston Cave, at the Asa Wright Nature Centre in Trinidad, is home to about 200 nesting pairs. ↑ BirdLife International (2012). "Steatornis caripensis". IUCN Red List of Threatened Species. Version 2013.2. International Union for Conservation of Nature. Retrieved 26 November 2013. ↑ Snow (2008), pp. 137-143. ↑ "Oilbird: Steatornithidae - Physical Characteristics". ↑ (Spanish) Carreño, R., J. Nolla & J. Astort (December 2002). Cavidades del Wei-Assipu-tepui, Macizo del Roraima, Brasil. Boletín de la Sociedad Venezolana de Espeleología 36: 36–45. Snow, D.W. (2008). Birds in Our Life. William Sessions Limited. ISBN 978-1-85072-381-3 (pbk). Wikisource has the text of the 1911 Encyclopædia Britannica article Guacharo.